This beautiful red and yellow flower grows in thin soil on rock ledges and along rocky slopes in woods, ravines and bluffs. The dainty flowers dangle from delicate stems, rocking constantly in the breeze. 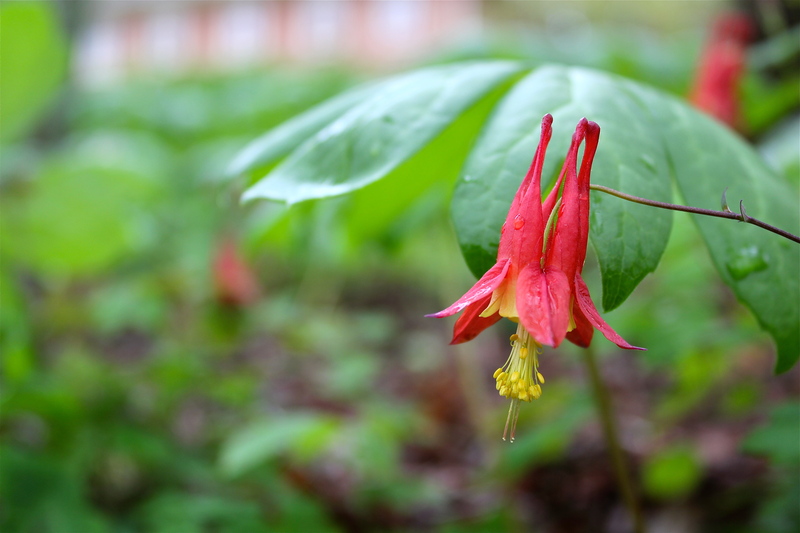 You can find columbine growing from April to July in Virginia. The elaborate flowers are only one or two inches long and have yellow petals with a red spur, and red sepals. The small leaves are lobed, in groups of three, and they appear at the base of the plant and sometimes on the flower stems. Locally, in Montgomery County, drifts of columbine can be found growing on limestone cliffs. Check out the gallery of photos below–obviously I had a hard time choosing which photos to include…sorry about that! My only excuse is my passion for plant morphology–because from that point of view, this flower is a rockstar!